Last week I had the absolute delight of taking some illustrations workshops at a local school. It was brilliant fun. The kids were wonderfully imaginative and inventive. 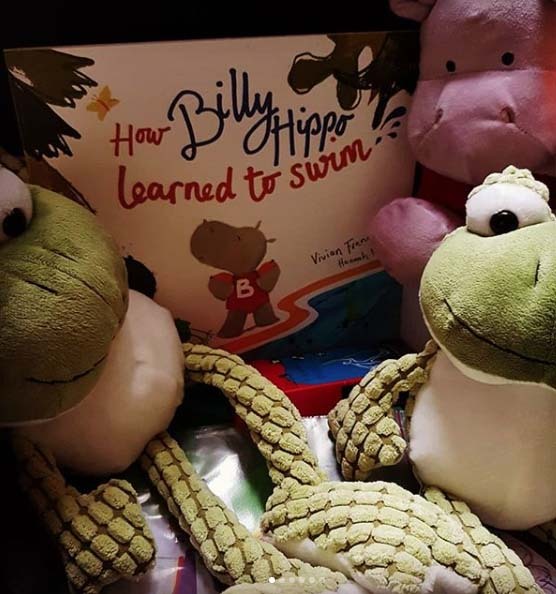 We sang a Billy Hippo song and did some Billy Hippo-themed crafts. I did feel completely exhausted afterwards though. I don’t know how teachers do it, day after day. At home, the advent calendars are out and it has blown Wren’s mind. Chocolate for breakfast? Marvellous! We headed out to Buckland Abbey at the weekend to mark the start of Advent. Buckland Abbey was the home of Sir Francis Drake. It’s a great place to visit at any time but it was full of Christmas charm this weekend. There was an enormous, sparkly tree in the old Thythe Barn. Up in the attic The Lord of Misrule was presiding over festivities. The Lord of Misrule was a character who would have appeared at Christmas on Sir Francis Drake’s ship, The Golden Hind. I suppose he comes from the old topsy-turvey traditions. Essentially, one of the sailors would take on the role of The Lord of Misrule, being captain for the day, playing practical jokes and causing havoc. Interesting fact, did you know penguins got their name from Francis Drake’s Welsh sailors who named them Pen-Gwinns, ‘White-headed’ in Welsh? This entry was posted in Illustration and tagged Billy Hippo, Buckland Abbey, Hannah Foley, How Billy Hippo Learned to Swim, illustration, illustration workshops, illustrator, Little Door Books, penguins, picture books, Sir Francis Drake, swimming, The Golden Hind, The Lord of Misrule, vivian french. Bookmark the permalink. Your props are wonderful. Sounds like you had a wonderful start to Advent at Buckland Abbey – interesting info about the penguins.